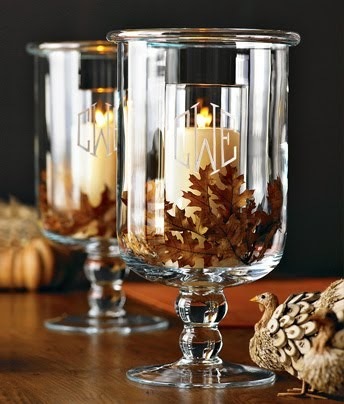 I haven't started decorating for fall yet..it just doesn't seem quite right in 80 and 90 degree weather! I'm sure I'll get the urge in the next few weeks. I love the smells of autumn though. It's the smell of things baking in the oven again, leaves burning outside, crock pots simmering something yummy for dinner, cinnamon, apples, pumpkin, cider, spices. Yum! My favorite candle in the world is Salt City Pumpkin Spice. I burn it all year around, but it's a bit pricey. Good old Wal-mart has some scrumptious candles out this fall for $5 each for the big ones. 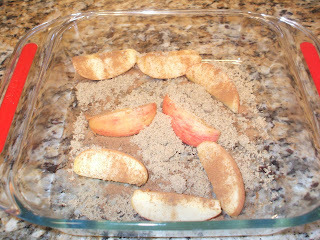 My favorite is mulled cider, although I found that the little tarts that you burn in the tart warmer are much stronger. My 8 yr old daughter loves it too~last week when she was home sick, I was burning one of the tarts, and she said, "oh mom, what is that? I just want to drink it!" :) They come in the same scents as the candles and are only .33 a piece~I've burned through all of mine and need to stock up! 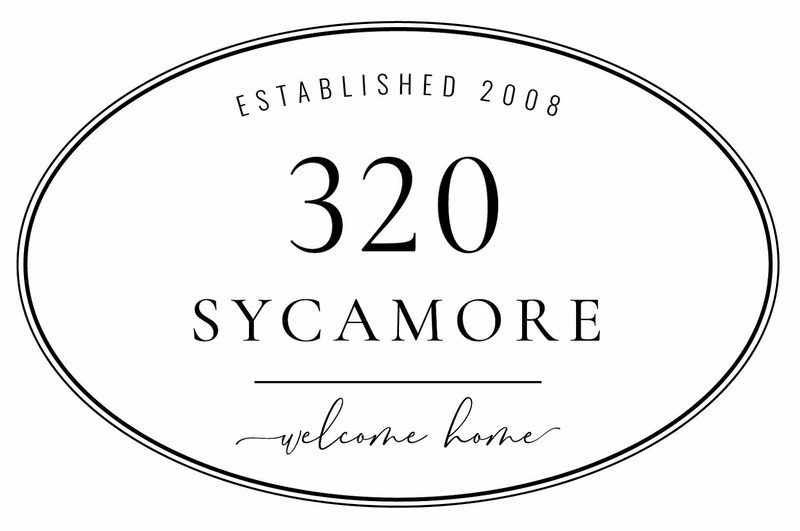 This is a tip from our realtor: Cut up an apple, sprinkle with cinnamon and brown sugar, put in a 180 degree oven, or you could simmer it in your crock pot, and in about an hour, your house will smell delicious. Or, you could bake an apple pie, but that's much too complicated for me. :) You can even eat the apple afterward. Now here is a sweet deal! There were $4 off 1 Glade Plug In coupons a few weeks back in the paper. My Target sells them for 3.97 a piece. I think Walmart's are also under $4. So, you can make about 3 cents on each one. 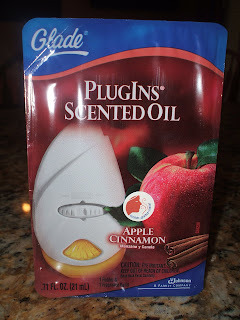 My favorite scent is the apple cinnamon. I bought 20 coupons from Ebay for 6.99, and got my 20 warmers for the year to stick throughout the house. This works out to be about 35 cents a warmer. Such a great deal! They expire on the 13th, so if you order some, be sure to use them before then! If they don't have the scent you want, I would still buy them and then you can exchange them later as they bring the apple cinnamon out for the holidays. One last little tip: I got this little concentrated fragrance spray from Bath & Body Works like 3 years ago~a little spray goes a long way! It's sweet cinnamon pumpkin and smells divine. 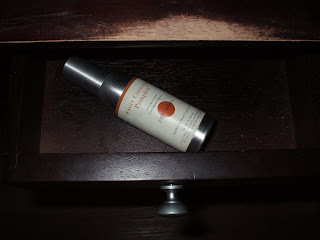 I keep it in the little drawer in my entryway so if someone comes to the door, I can shoot a spray of this and the smell of sweet cinnamon pumpking emanates from the door instead of the stinky diaper I just changed. Lifesaver! What are your favorite smells of autumn? Hi! I love candles too and can almost smell yours!! You hit on all my favorite scents! I always go for Yankee Candle "pumpkin spice." I would burn it all year round if I could...maybe I should! But I appreciate the tips on the plug-ins, maybe I'll have to try them! I totally agree, there is nothing like the smell of pumpkin pie and cinnamon and apples! Your family portrait is gorgeous. I love fall smells as well - I love the scentsy candles, they are candle warmers but very cute containers and warmed by a light bulb so they give off that little glow when it is dark. There bars are about $5.00 so they are more affordable to change your scents rather than buying an expensive candle. I love to change the scents I am burning with the seasons. Thanks for the great tips! I so loved the adorable photo at the end...your little boy in black & white and pumpkin colored!!! I live in AZ and decorated around my front door in 105 temp. today. A girl can dream can't she? Feel free to come take a peek. MMMMmmmmmm, I need to go and find a new Pumkin Spice candle. I burned mine all up LONG ago! Yummy...it is my FAV too!!! Oh, I love autumn scents, too. I've discovered the Wal-Mart candles, too. I have the pumpkin spice, the mulled cider, and gingerbread, but the cider is my favorite, too. I haven't tried the tarts, yet; I'll have to pick some up. I love the idea of spritzing something yummy when someone comes to the door. 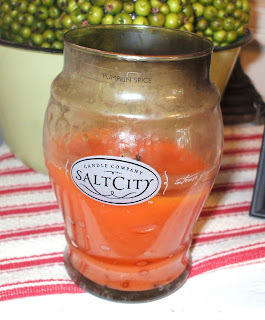 One of my favorite fall smells is the Sugar Cookie Salt City candle YUM! Yummy, autumn scents are just the best! Even if I could do nothing else, I'd have the wonderful smells of Fall permeating the air! Great job on your post and THANK YOU for being a part of Fall Nesting Week! What great tips! I'll have to try baking the apple slices in the oven. 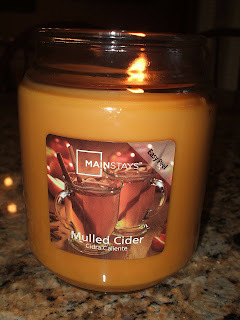 I use mulled cider/cinn apple candles year round!! 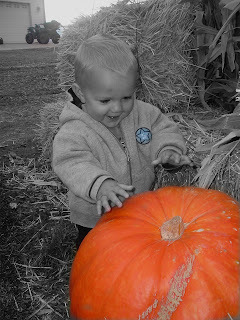 Okay I LOVE that picture of Spencer and the pumpkin. Looks like it came right out of a magazine! I miss him so much. Oh, and one of my favorite smells is chimney smoke when it gets cold. It reminds me of grandma's I guess. Kind of weird, I know, but reminds me of home. I know how you feel - it was 92 degrees here yesterday, yet I was decorating Halloween candles last night. I just can't wait for Fall to move in! I also love the Walmart Mulled Cider and B&BW Sweet Cinnamon Pumpkin. Walmart's pumpkin scent is also great.